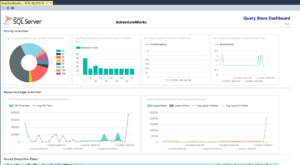 The Query Store Dashboards provides additional query performance information on databases that have the Query Store feature enabled and can be loaded by adding the .rdl files as a custom report in SQL Server Management Studio. This dashboard shows you Query Store information and query runtime statistics for a single, Query Store enabled, database. 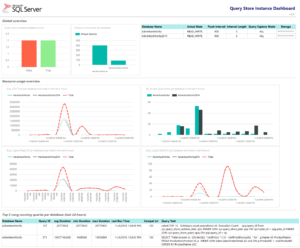 The Query Store Instance Dashboard aggregates query performance runtime statistics for all Query Store enabled databases inside your SQL Server Instance and displays them in easy to understand graphs. The installation and usage documentation for the Query Store Dashboard can be located on it’s GitHub page Wiki here: https://github.com/Evdlaar/QueryStoreDashboard/wiki/Installation. You can download the lastest release of the Query Store Dashboards through Github: https://github.com/Evdlaar/QueryStoreDashboard/releases.